As well as selling my goodies online, I like to attend craft fairs and summer fetes and things. I’ve only done four so far, and I’m learning new things each time. Last year I was invited by Ellie at Ultimate Gift Packs to have a stall at the Christmas Fair she was running at Weyhill Fairground Craft and Design Centre. Cayden and I had a great time, and I look forward to attending again this year. Weyhill Fairground is a beautiful little place, and we plan to get back at some point this year for a proper look around. While we were there I wandered around the stalls quite a bit, like I always do. I spent a wee bit of money at some beautiful stalls – I’ll blog about those later. As I said, I learn new things at every fair. I get new ideas for stock, and for display, and just general things I’d never thought of. One idea that really struck me was having a cute way to display my business cards. I also found this adorable Harry Potter one from Pinterest. 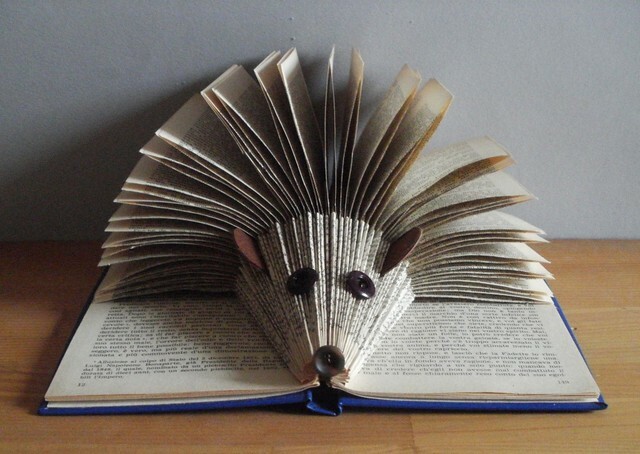 …has sold, but the seller, Maplewood Book Art, has a LOT of really cute folded book art that is just so inspiring. I could bombard you with picture of hedgehogs all day, but I’ll restrain myself. Just this last one, which you can buy at Creation Crafts and Gifts – to show you how to display business cards in one. Folded books and altered books are things I’d like to try, but I have a very long list of things I want to try and haven’t quite got around to yet. But when I saw a video pop up on my YouTube subscription feed for a place card holder, I thought that’d be perfect to hold my business cards. I used a 12×12″ sheet of craft card rather than origami paper, and by the end some of the folds were quite difficult. But for a first attempt I think it looks pretty good. I will be making some more for practice. Maybe I’ll use a thinner paper next time. Keep your eyes peeled for updates, and hopefully a book hedgehog of my very own! Note: I’m submitting this blog post to Skip To My Lou‘s Made By You Monday. It’s my first time, and I hope it’s okay 🙂 Let me know what you think.